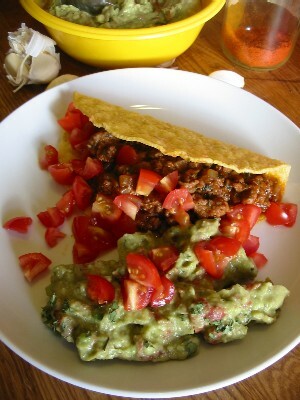 Today’s post also combines two things, but in this case it’s beef tacos and guacamole. The guac is fairly standard except that I’ve omitted the onion and replaced it with garlic. The tacos may seem to contain a lot of ingredients. Please don’t skip anything – each ingredient is like a piece of a puzzle, and you’ll be left with a gaping hole if you do. This mini fiesta will feed 6 people – always a great excuse to have friends over for margaritas. Unsalted – of course. To prepare the guacamole: Place diced avocado in a deep bowl and mash with a fork, as smoothly or coarsely as desired. Add remaining ingredients and mix well. Chill before serving. Makes 2 cups. To make the tacos: Preheat oven to 300 degrees. Place taco shells on a baking sheet. Place sheet on middle rack in oven and bake 5-10 minutes. Place onion, garlic and ground beef in a large saute pan. Brown beef over med-high heat, stirring frequently. Once beef is cooked, lower heat to med-low and add remaining ingredients. Simmer, stirring frequently, about 10 minutes. Remove from heat. Remove shells from oven and fill with beef mixture. Serve with guacamole, chopped tomato and sour cream if desired. Hi can you please advise on the recipes how much a serving is? You usually say per cookie or per slice if cut in 12. Thank you!! P.s cant wait for more. On most recipes I’ll simply state “serves X” but I don’t put the actual serving size. To calculate, just divide the total amount by servings. Sorry I don’t put serving size = X cups, etc. It’s just a hassle for me (and this is a free site – meaning, unpaid work for me!) Thanks for your understanding.